Probably every Japanese person knows who 山下清 (Kiyoshi Yamashita) is. He’s a famous Japanese artist. 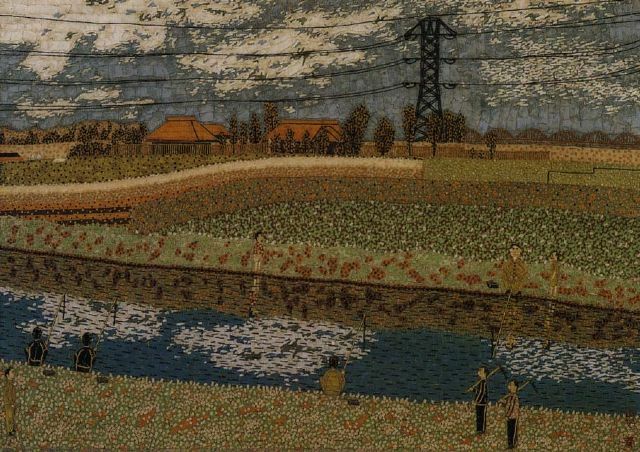 Often called the “Japanese Van Gogh“. He died in 1971 at the age of 49…but if he was still alive today, last Wednesday would have been his 88th birthday. Kiyoshi Yamashita was born in Tokyo on 1922 March 10 (his birth name was Seiji Obashi). He suffered an illness as a young child that stunted his mental growth and he was diagnosed as mentally handicapped (some people now believe he was autistic). In elementary school he was bullied because of his mental handicap and slow speech. So his mother enrolled him in a boarding school in Chiba, Japan for special needs children. In 1940, Japan was at war and Kiyoshi Yamashita was eighteen years old and now potentially eligible for the Army draft. So he ran away and began a life as a vagrant wandering around Japan and painting the scenes he saw. When he was eventually forced to register for the draft he was found unfit due to his handicap, but he said that he enjoyed life on the road and he continued wandering for a fourteen years. His art style is mosaic. He cuts pieces of colorful paper and glues them to a canvas to create a beautiful scene. An amazing fact is that he would remember a scene that he saw and recreate it on his canvas later. He was able to memorize all the details that he saw…which is why many people believe he was autistic (the disease that Dustin Hoffman’s character had in the movie “Rain Man“). Life on the road wasn’t always easy, of course. He often had to beg for money to buy food. But he spent his money as frugally as possible and at one point he was arrested for vagrancy and the arresting officer found ¥10,000 in his bag that he was able to save up (which was a considerable amount at that time). But when the police officer accused him of stealing it, Mr. Yamashita wasn’t able to explain himself clearly. According to Mr. Yamashita’s biography, the officer beat him and pocketed the money. 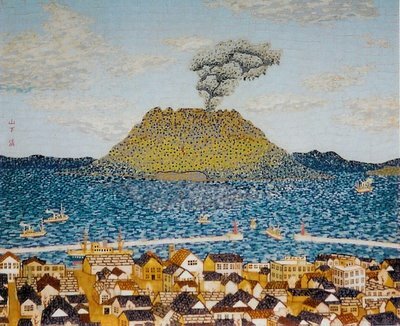 At one point after Kiyoshi Yamashita stopped roaming the country and settled back down in 1954, he was given a chance to teach an art class for other mentally handicapped people. He told them to never feel inferior and if they believe in themselves they can be like an Army general. So, from that quote and also the way Mr. Yamashita had a habit of dressing without a shirt, he was given the nickname 「裸の大将」 (“The Naked General“). There is a TV series in Japan based on his life. 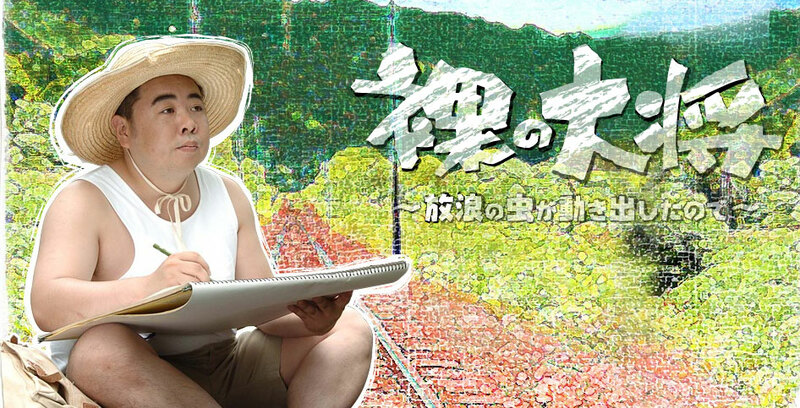 The series is titled 「裸の大将」 (“The Naked General“). 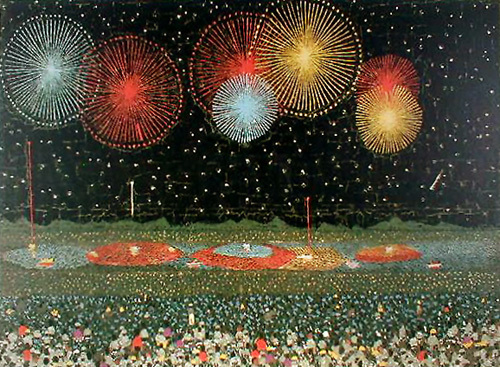 With all the dots, it reminds me more of Seurat or Monet. >With all the dots, it reminds me more of Seurat or Monet. Really? I’m not sure why, but he’s referred to as the “Japanese Van Gogh”, though. Yes. And it’s amazing that he recreated the scenes from memory. Fascinating post and what beautiful art work!